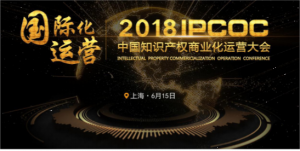 The second 2018 IPCOC China intellectual property commercialization operation conference is about to meet with you on June 15th, 2018. 2018 IPCOC China intellectual property business operation conference will take “international operation” as the main theme, inviting the representatives of the organization with rich experience in intellectual property rights at home and abroad to gather in Shanghai. Through high end dialogue, it introduces the issues of sharing PCT member countries on the protection of industrial property rights,operating experience, how to build high value patent system, and how to operate high standard operation patent of domestic intellectual property operation institutions. The conference has invited several companies overseas which are docking “technology achievement transformation” demand operations, such as: the world’s first patent online auction of American company Ocean Tomo, committed to intellectual property services with “The Belt and Road” CATHAY IP, Israel Weitzman Institute “Transferable Technology” held at the scene, etc. We hope to provide the participants with the opportunity to cooperate deeply. The preparatory work for the 2018 IPCOC China intellectual property rights operation conference was officially launched months ago. We are inviting the world’s leading enterprises and service providers of intellectual property rights to discuss practical hot topics and jointly promote the progress of the industry!